Carillon Styles are only available directly from this website and are written by our in-house team of dedicated writers. So if your organ does not have a style for a song you wish to play or you just want something new to inspire you, then we probably have the answer. It's simple! choose the disk/s you would like to order, add them to the cart and pay with your credit/debit card or PayPal account. Once your order is processed you then wait for the disk to be delivered by the postman or if you selected the "free instant download option" you can go to your account and download the styles straight away. Then just copy the files from your computer onto a floppy disk or Compact Flash Memory Card. Take the disk to your instrument plug-in and load in the normal way. N.B. Download files include a full file listing and instructions for loading. Although the styles will work without doing so we strongly advise that for each disk you load file 1 then file 2 so that the correct sounds, tempos, etc load with the styles into your instrument. The styles are designed for general use and therefore if called Samba we would expect you to be able to play just about any Samba to it. See our style disks below and open up more possibilities for your repertoire! 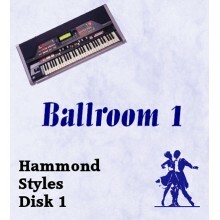 Ten exclusive Ballroom and Latin styles with registrations never before seen on .. 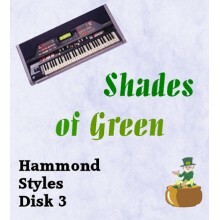 Ten exclusive Irish Themed styles and registrations never before seen on Hammond..